Orris Root has been used historically as a powerful diuretic to alleviate excess water retention problems and edema, and improve kidney function. 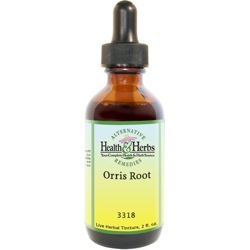 Orris Root extract is great for sore throats and dental problems, because of its anti-inflammatory action. It relieves chest and nasal congestion and can be useful for symptoms of cold and flu. Because of it's anti-inflammatory action it is good for inflammation of the spleen, kidneys, and liver. And it has been found to be effective for skin disease and may reduce bruising of the skin when used externally. The extracts have been used to promote digestion and to increase the appetite. A 2003 study published in the "Journal of Entopharmacology, isolated nine chemicals in Orris Root that have the potential to reduce inflammation. Also, the root has various anti-inflammatory flavonoids and isoflavone glycosides. These constituents make the herbal extract an excellent choice for muscle and joint pain, it reduces bruises and skin disease. The herb has a protective, astringent and healing effect, and is believed to have a positive effect on the skin's moisture content and elasticity. The Orris Root is a soothing aromatic herb it has been called a "stomachic," giving strength and tone to the stomach, stimulating digestion and improving the appetite. It is also said to relieve colic. Also considered to be purgative, which can help to move the bowels, and has a stronger action than a typical laxative. As an emetic, in large doses, it will cause nausea and vomiting. Orris root tincture has strong expectorant properties and it is believed to help detoxify the body, which can be helpful for illness. In herbal medicine, Orris Root tinctures, or tea, is used for 'gland stimulation', 'purifying the blood', 'increasing kidney activity' and bile flow. It has been used for diabetes, colds, bronchitis, back pain (sciatica), swelling and inflammation of the spleen. It can also be used for emptying the bowels, inducing vomiting, to relieve shortness of breath, resisting poisoning, as a uterine stimulant, and promoting calmness. Orris root is an effective expectorant and has been useful in catarrh, or disorders that cause inflammation of the mucous membranes such as bronchitis, sore throats, sinus headaches, and cough. It is sometimes applied directly to nasal polyps, gums, tumors, scars, burns, cuts, muscle, and joint pain. Oris root has been used traditionally in dental care. The powder was given to babies when they were teething. In the 19th century, it was chewed on to disguise bad breath, or mouth odors and toothaches.Orris root extracts contain myristic acid, a known bacterial agent, and it is found to be especially effective in toothpaste and powders. Ingredients: Orris Root, Structured Water, 20% Alcohol. Non-Alcohol: Orris Root, Structured Water, Vegetable Glycerin. Instructions: Use 6-12 drops in juice or water, under the tongue or as desired. May be taken 3 times daily. Shake well. Store in co, l dark place. Keep out of reach of children. Contraindications: Orris Root should not be used with prescription diuretic medicines. Large amounts (many times the recommended dosage) will cause nausea, vomiting, purging and colic. From Lynne Robinson of Rathdrum, Idaho on 12/29/2012 .